All the trips are starting to run together even for me and I figure unless something special or exciting or excruciating happened … who cares. So from time to time I will do special posts on special topics. You can guess what this one is about from the title, right? Unfortunately, I have had several mishaps, one of which was reportable. All were minor in nature although the reportable incident was pretty expensive. Let’s take them in chronological order. In fact, let’s include the one that occurred in training even though I wasn’t really responsible and I’ve already described it. This was perhaps my second day driving out on the road in north Houston during training. I could barely shift and was generally Mr. Cautious behind the wheel. I did not have my CDL at this point. I was on a side street in an industrial section of the city waiting for a green light that would allow me to make a right turn onto a busy road. There was a turn lane from the right. When I finally got my green, not wanting to appear too timid, I started out into the intersection when the Kenworth abruptly stopped. We heard a big clunk and we were dead in the water. 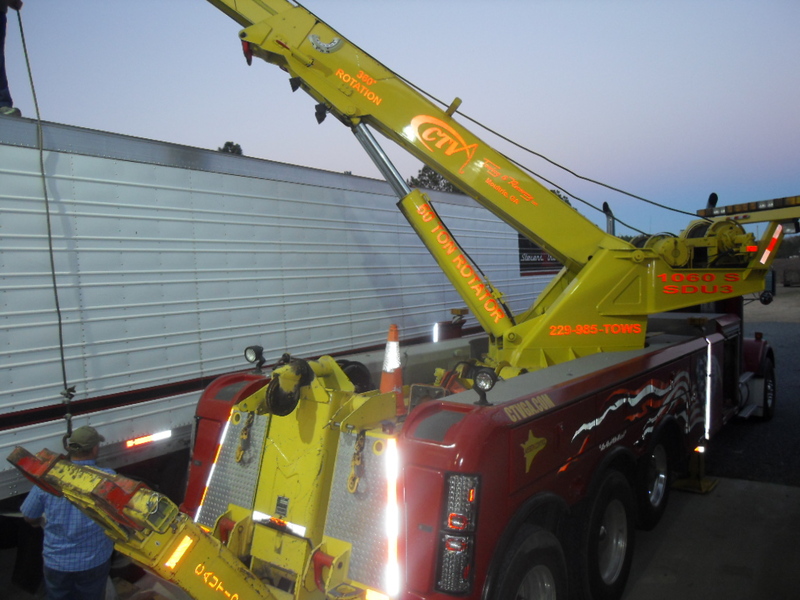 Gary, our big Limey trainer, knew, correctly, that with a little Pontiac in the turn lane, I would not be able to pull far enough out into the roadway to clear the trailer around a light pole at the corner. He had slammed on the trainer brake as I was accelerating and it tore something up pretty good. While the engine was purring, there was no way to get it into gear and move it either forward or backward. Actually, that’s not entirely accurate. Since there was a slight incline up to the main roadway, I could let it coast backward and thus get my rig out of the lanes of traffic, which I did after a couple of students got out to make sure things were clear to the rear. Now Gary could have just said, “Bob, STOP. There’s no way you can make it, and I would have stopped before I got into real trouble. But ever the dramatic Brit, he thought it would make a bigger impact to stomp on the brake. I don’t know how much it cost to repair, but I didn’t lose any sleep over it. In fact, giving it another think, I’m not even going to count this as a mishap. During my time with Dudley, my first Stevens over the road trainer, he had to go pick up a prescription at Walmart on one of our trips through Fort Worth. Now this particular store wasn’t conveniently located facing a freeway like most of the Walmarts on the face of the earth. This Walmart was five miles off I-35W in the middle of a residential area. Getting back to the store wasn’t the issue though. Finding a place to park was. Dudley directed me to the back of the store where we would park like we were going to make a delivery. It was actually pretty dead behind the store, but the roadway was rather narrow. As I was navigating my way across the back of the store I had to make a rather sharp turn to the left and in making that move the rear of the trailer caught a large bale of boxes that had been compressed and loaded onto a pallet. I don’t know why they didn’t tuck it up against the building, but I moved the bale a couple of feet. Unless somebody had actually witnessed the incident there’s really no way anyone could know that the bale had been touched. There was certainly no apparent damage to the crushed boxes or the pallet. It was kinda out away from the building and not squared off or anything. So after checking that we hadn’t done any damage to the trailer – which we hadn’t – we went ahead and parked at the other end of the building. I was kinda sweating that there was a surveillance camera that caught everything on video, but you’d have to study the recording pretty closely to see that anything had happened and unless there was something else they were looking for, there would be no reason to study this recording. Dudley went in and got his prescription. I picked up some junk food and a couple of bananas. We met back at the truck and found our way back to the freeway where we belonged. No damage. No foul. For what it’s worth, Dudley, who is white, appears to be the minority in his neighborhood. 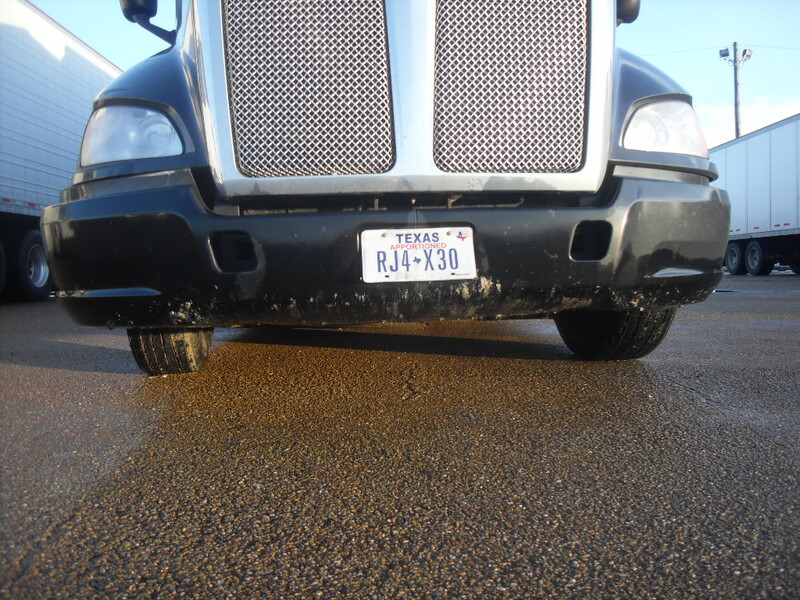 On one of my first solo trips, I had picked up a load of produce in Laredo and was hauling it Dallas. The pick up was delayed until after dark. By the time I got to my first fuel stop at a Love’s south of San Antonio I was almost out of hours and it was past midnight. I got my fuel but there was no place to park. And I didn’t have enough time left to drive to another truck stop, not that it would have had space available. Well having seen truckers parked every which way but on top of each other at other truck stops, I pulled around and parked adjacent to the last fuel lane way out to the left of the building. There was actually another truck parked outside of me, so that gave me some additional comfort. The front of my truck was up pretty close to the fuel pumps but there was easily enough room for other trucks to pull up and get their fuel. I stripped down and got into my bunk, but slept with one eye open since I was halfway expecting to get a knock at the door and instructions to move. Actually, tired as I was, I was sleeping pretty soundly when the knock came. It was another driver who, thoughtfully I presume, was calling my attention to a couple of legitimate parking slots that had opened up. I pulled on my boxers and slipped on my shirt, and cranked up the engine. I checked both rearview mirrors and started easing back when I hit something. POOP! Some idiot had parked right behind me. Now why the hell would somebody feel they had to park behind me at that time of night. There were fuel lanes open. I pulled a few feet forward. My mind was running through all the trouble I was in as I scrambled outside and to the rear of my trailer to see what damage I had wrought. It was in the low 50s, I was wearing boxers and a shirt. I was barefoot. There, a black dude with a cup of coffee was looking at the front of his old flatnose Peterbilt. Gawd, I was sorry. But he was all calm and told me he had just stopped in to grab a cup of coffee and saw me back into his truck as he was leaving the building., as he leaned down to study his front bumper. It was an old truck and in the dark it was hard to tell even what color it was. 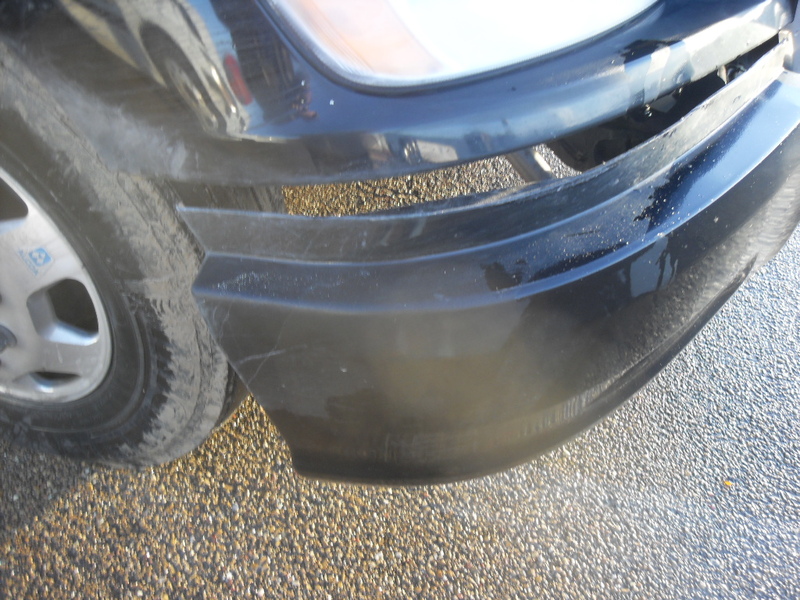 The bumper was a mean looking thing that did have a color – rust. There was no evidence that anything had happened. He touched me on the shoulder and told me not to worry, it would be okay We’ll just forget about it, okay? I heaved the biggest sigh EVER, and after thanking him profusely, went back to my truck, waited for him to move, and then circled through the parking lot to put myself into the legitimate parking spot the first driver, the jerk, had called to my attention. I was actually able to get back to sleep, but as I was stripping down again, noticed one more thing. I had my boxers on backward. Embarrassment, on top of humiliation, finished off with a total loss of dignity. But it was an incident that would not make it to my record. Phshew! I’ll tell you up front, this one made it on my record and cost me some serious money. I had dropped a load at a Walmart distribution center in Alabama at 4 a.m. and made my way to a produce grower in Moultrie, Georgia shortly after the sun came up. The Walmart facility had probably 300 doors and was the very picture of a large scale, well-designed warehouse facility. The produce grower had a 30’ by 50’ metal building with a single door on the back. And he wasn’t ready, even though I had busted it to get there at the appointed time. His mini-warehouse was at the end of a 500 foot long gravel road off a two lane blacktop road (no shoulders) that was a mile or so off a two lane state highway on the west side of town. It could not have been more different than the Walmart facility. Well since he wasn’t ready for me yet, I pulled into an open area away from the building and crashed for a few hours. I was tired. After couple of hours after I woke up I was notified that my load was ready and I could back up to his single door. So I positioned my rig and started to back into place. I got out twice to scope things out. During the first look I opened my back doors. This would be a tight squeeze, not because there was a truck on either side of me, but because there were stanchions projecting out from either side of the door. Not sure why they were there but they were pretty substantial steel protuberances; I didn’t want to hit them. And I didn’t. So close. Too close. I only had a couple inches of clearance on the other side. Even though I had cleared the stanchion on the drivers side by three inches it wasn’t enough to get me past the stanchion on the other side. As I looked out the passenger side into the mirror, I saw one of the workers looking at the stanchion on that side. This was not good. I shut down the truck and hustled around for a look. The dude was shaking his head as I approached. I didn’t hit the stanchion head on (rather rear on), but the door had slid into the space and, like a fishhook, it was in but wouldn’t come out cleanly. I got back behind the wheel and tried to gently pull forward. I actually pulled the stanchion away from the dock. We tried every solution we could think of that utilized human power. Nothing worked. I was really wedged in there. I finally made the call to road rescue. I provided photographs. They said they would dispatch a wrecker. While waiting for the wrecker, the owner of the facility said this was not the first time this had happened. 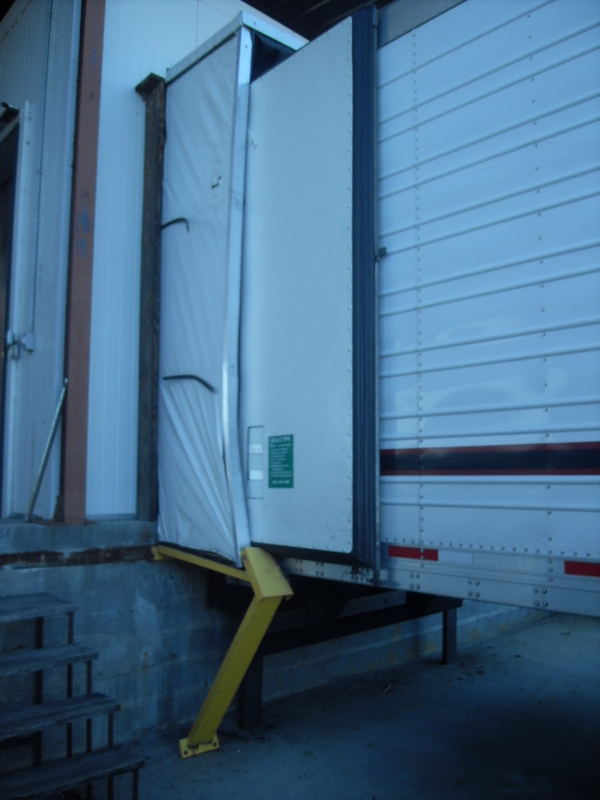 In fact, he said, he often advised truckers to back up to the dock with the doors closed first, and then after ensuring they were exactly in the middle of the two stanchions, to pull ahead a few feet, open the doors, and then back straight in. Why the f*@& didn’t he tell me that before I started to back in. After a couple of hours, the wrecker finally showed up. This was one of those wreckers that was Superman, The Incredible Hulk, and that liquid metal badass villain from Terminator 2 all wrapped up into one beast of a wrecker. This was the biggest, strongest wrecker I had ever seen. And EXPEN$IVE. They rigged a belt around the back end of the trailer, lifted it just a couple of inches and moved it over another couple of inches before setting it gently back onto the ground. Free at last. Did I say Free? The wrecker alone was a $500 expense. There was a little damage to the seal of the door. Stevens insurance folks settled with the business. I don’t know what the total damage was, but I was informed that my share of it was ONE THOUSAND DOLLARS (picture my head swiveling 360 degrees like Steve Martin’s did in The Jerk). I’m still paying for it – 50 bucks a week. As I’ve thought about this even in the weeks since, I believe this farmer is running a scam. I think every other truck that visits the business does the same thing I did. The farmer hits the driver of the company up for damages. He pockets the money, doesn’t fix anything, and waits for the next sucker to back into his stinkin’ stanchion. I have vowed to never return to Moultrie, Georgia. At least not to pick up any of this guy’s cabbages. This one happened most recently when I was backing into a pretty tight spot at a truck stop in Florida. I got out once to look and everything looked cool. After I was in, the guy in the next truck was giving me dirty looks as he looked over the driver’s side of the tractor. I got out to learn what had happened and he told me he had felt me bump into him. But danged if he could see where. No harm. No foul. After 20 minutes or so I looked over and saw him working on his driver’s side rear view mirror. I opened the window gave him a questioning look. He said I must have touched his rear view mirror frame because a zip tie had busted loose. No other damage, just the zip tie. He was trying to refasten the wiring that the zip tie was holding and having a hard time. I gave him a couple of zip ties I had in my miscellaneous drawer and we both lived happily ever after. This was a stop where I had made arrangements for the TA mechanics to work on my APU (Auxiliary Power Unit). I checked the oil on the unit – which wasn’t easy – and found only a few drops on the bottom of the cute little APU dipstick. They took three hours to do a simple oil change, and after all that, they still couldn’t get the unit to start properly. By this time, it was almost 1 a.m. I had been up since 3 a.m. the previous morning. I was without auxiliary power and would have to let the big tractor motor run all night to stay warm. All in all, not a very fun day. Poor Shake. In mid-January I had occasion to deliver a load to a grocery distribution center in central Mississippi. It had been raining pretty good for a couple of days. I had spent at least 24 hours at a truck stop about 40 minutes away and I heard the rain on the truck for at least 23 of those hours. I got the facility way before dawn and the actual delivery went fine. After the delivery, however, I had to park it for a spell to await instructions for my next load. “Go park along that there fence,” the lumper told me, pointing across the large lot to the chain link at the north side of their property. 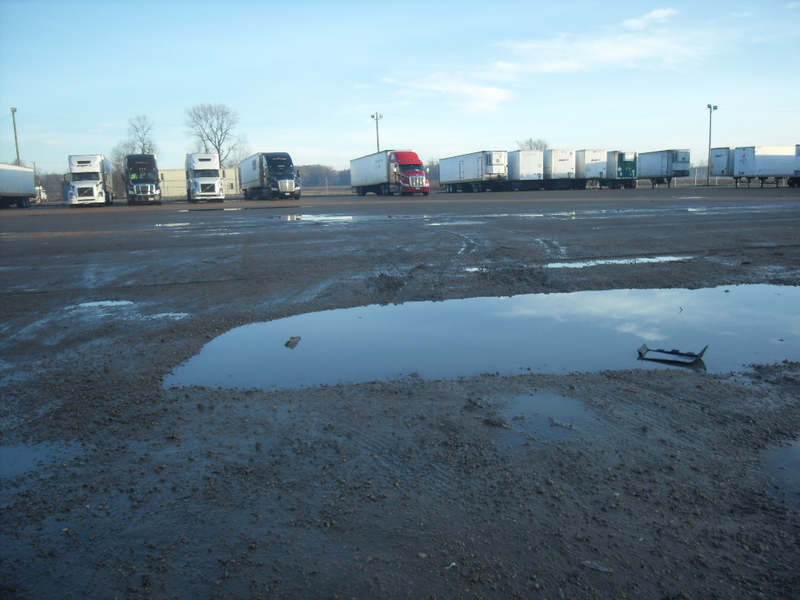 Here’s a shot of the innocent looking puddle looking back to where I was to park. That’s my truck in the middle. Now it was dark when I was executing this move, and I had no inclination I was about to enter the Marianas Trench of Sunflower County (real name). But when I pulled into this cute puddle, I didn’t realize it was almost three feet deep. My steer wheels kept going down, down, down. I started but figured I needed to get through it. Once my steer wheels were coming up the other side of the chasm, I had second thoughts and was afraid it might just break my tractor chassis in half so I stopped and tried to back out of it. I was able to back out with no problem … I thought. After I extricated myself from this watery grave and got situated at my rightful place back against the fence, I got out to investigate how dirty my rig got. This is what the Sunflower Trench had done to my tractor. Believe it or not, the heavy metal bracing that held the bumper to the frame was torn completely away on the worst side and partially torn on the side that looked like it hadn’t been hurt. On my way out, I informed the security chick of what had happened and suggested they might want to flag this puddle so other drivers might avoid even worse damage. She insisted on calling her supervisor out. I wish she hadn’t. This pot-bellied southern sheriff wannabee waddled out and spent 15 minutes on his cellphone not 20 feet away from me before even acknowledging my presence. Then he waddled over to me and asked me where I was from. Texas, I replied. “Well don’t they teach you down in Texas not to drive into bodies of water if you don’t know what’s under them?” he inquired fatheadedly. I inwardly gasped, but kept my cool. This was a customer and I didn’t want to alienate a customer. So I said, I might have given it some thought if I was out on the road someplace, but didn’t have that kind of concern in a Super Value parking lot. The company couldn’t pin this one on me and it’s a good thing. Twenty five hundred big ones later and the rig was fixed. I now avoid all but the tiniest puddles. I’ve had two occasions where I have touched another trailer with my trailer – both times in drop and hook situations. In both cases I knew I was close and when I stopped to get out and look, I saw that a couple of molecules on my trailer were swapping spit with a couple of molecules on another trailer. After I got into the slot, I looked very closely and could see absolutely no damage, although there was a dab of saliva. Again. No harm. No foul. I ain’t gonna hit anything else, ever again. This is not to say that somebody else won’t have a mishap onto me. That’s fine. I will not be at fault. A $1,000 lesson is the only lesson I need.